WAR PASSENGER Doc About Writer David Axe Gets A Trailer! War Passenger is a documentary film that tells the story of David Axe, a middle-class, suburban-raised South Carolina resident who walked away from his family, friends, and career to travel to Iraq in 2005 at the peak of the Middle Eastern conflict. Armed with only a backpack and a video camera, David embraced his role as a “citizen journalist” and continued to seek out the world’s worst war zones. Since 2005, he has reported from Iraq, Afghanistan, Lebanon, Somalia, Chad, Congo, and East Timor. During his travels, David began to write autobiographical comic books detailing a life at war where IEDs, piracy, and child soldiers were an everyday reality. Utilizing over 100 hours of David’s personal video footage, War Passenger takes you to the frontlines of the world’s conflicts and shows you how hard it is to come back home. 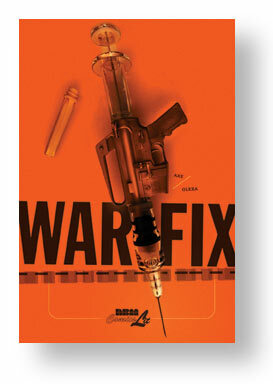 NBM readers are familiar with his multiple award winning book, War Fix, which Axe collaborated on with Steve Olexa. Visit warpassenger.com for more information. Author Stefan BlitzPosted on April 26, 2013 Categories BlogTags david axe, Documentary, Movie trailer, War FixLeave a comment on WAR PASSENGER Doc About Writer David Axe Gets A Trailer!